On June 10, 2018, the small-scale talks of the 18th Meeting of the Council of Heads of Member States of the Shanghai Cooperation Organization (SCO) were held at the Qingdao International Conference Center. President Xi Jinping chaired the talks. Prime Minister Narendra Modi of India, President Nursultan Nazarbayev of Kazakhstan, President Sooronbay Jeenbekov of Kyrgyzstan, President Mamnoon Hussain of Pakistan, President Vladimir Putin of Russia, President Emomali Rahmon of Tajikistan, and President Shavkat Mirziyoyev of Uzbekistan attended the meeting. 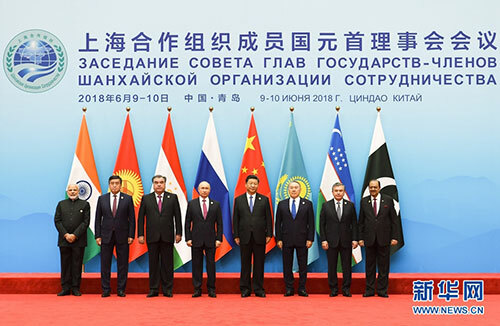 Leaders of all the SCO member states exchanged views on the development of the SCO and major international and regional issues. At around 9:00 a.m., leaders of the SCO member states arrived at the conference center in succession. Xi Jinping welcomed them warmly, shook hands and exchanged greetings with them. After then, all leaders took a group photo. Xi Jinping pointed out in the speech that since its establishment 17 years ago, the SCO, in the face of international vicissitudes, has upheld the “Shanghai Spirit” and scored tremendous achievements, becoming a comprehensive regional organization with important influence in the world. Now, the SCO is standing at a new historical starting point. We should carry forward the fine tradition, actively deal with internal and external challenges, and comprehensively promote cooperation in all fields, so as to push the SCO for steady and long-term development. Xi Jinping raised four proposals on the development of the SCO. First, we should carry forward the “Shanghai Spirit” and strengthen solidarity and coordination. We should stick to mutual trust, mutual benefit, equality, consultation, respect for diverse civilizations and pursuit of common development, and deepen solidarity and mutual trust, increase mutual support and translate the potential and opportunity brought by the membership expansion into more tangible cooperation outcomes. Second, we should promote security cooperation and join hands to cope with all challenges. We should uphold the common, comprehensive, cooperative and sustainable security concept, cope with traditional and non-traditional security threats in a comprehensive manner, and effectively fight against the “three forces”, in a bid to practically safeguard regional peace, security and stability. Third, we should deepen practical cooperation and promote common development. We should make bigger moves in such aspects as industrial coordination, market integration, and exchanges of technologies. We should follow the principle of extensive consultation, joint contribution and shared benefits, strengthen exchanges and cooperation in infrastructure construction, connectivity, industrial parks, scientific and technological innovation and other fields, and share huge development opportunities in Eurasia. We should send the unanimous voice of supporting trade liberation and facilitation to maintain global multilateral trading system. Fourth, we should play an active part and show international commitment. We should firmly safeguard the international order and international system with the purposes and principles of the Charter of the United Nations as the core, promote the building of a new type of international relations featuring mutual respect, fairness and justice and win-win cooperation, and stick to resolving the hotspot issues through political and diplomatic means. 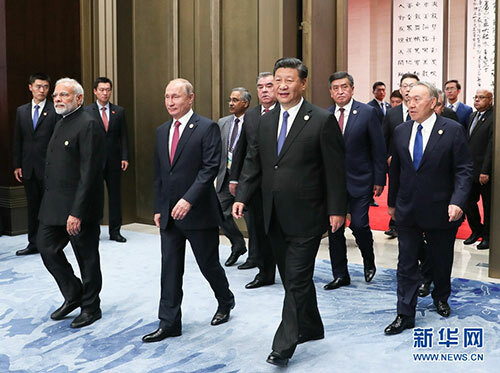 Xi Jinping stressed that the SCO is a cause that conforms to the trend of the times, as well as is in line with the common interests of all countries. China is willing to, together with all parties, remain true to the original aspiration, march forward hand in hand, promote the SCO to realize new development, and build a closer community with a shared future, so as to make new and greater contributions to safeguarding world peace and stability and promoting development and prosperity of humankind. Leaders of the SCO member states spoke highly of China’s contributions as the presidency over the past year to promoting the cooperation among all member states as well as the development of the SCO, and agreed that the meeting this time was the first summit after the membership expansion of the SCO and it was of major realistic and historical significance. The accession of the new member states has enhanced the SCO's capacity for cooperation in all fields. The SCO has also shouldered greater responsibilities in safeguarding regional security and stability and advancing development and prosperity. Under the new situation, the SCO should stick to carrying forward the “Shanghai Spirit”, continue to intensify communication and coordination, fully grasp the opportunities, properly cope with challenges, push forward all-round cooperation in economy, trade, finance, agriculture, connectivity, and people-to-people and cultural engagement, and stick to fighting against the “three forces” to ensure the sustained, healthy and stable development of the SCO. The meeting decided that the 2019 SCO Summit will be held in Kyrgyzstan. Wang Yi attended the above activities.